I don’t care for gambling or gratuitous public drinking, and crowds definitely aren’t my scene, so my love for Las Vegas frequently surprises people. I routinely bump into acquaintances who share my feelings, and have avoided Las Vegas because they believe it’s too much of a “sin city” for them. I won’t lie, there is gambling everywhere, hotels intentionally route you through their windowless casinos to get everywhere. Sexualization is everywhere too, from scantily-clothed wait staff in the casinos to outright x-rated advertisements that litter the ground as you walk down the strip. I’d never call Las Vegas family-friendly and am glad they’ve backed off their attempts to make it so. And over-the-top EVERYTHING, which is a nice escape from time to time. Everything in Las Vegas is bigger, more extravagant and indulgent. So, my similarly-minded friend of mine, if you’re looking for some non-gambling, non-drinking, non-sexualized things to do in Las Vegas, here’s my tour of the goodies I’ve found. 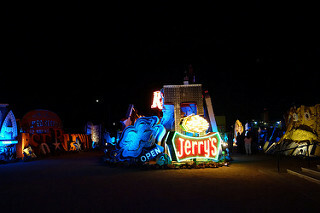 Before I knew much about Las Vegas, I knew about the neon lights on the strip. It’s what I always dreamed of seeing when I thought of Las Vegas, a sparkling city of lights rising from the middle of the desert. Las Vegas doesn’t disappoint in this regard. Much like Times Square in NYC, walking down the strip at night is well-lit because of the huge screens and sparkling neon. The Walgreens has a neon sign, and so does the Denny’s. 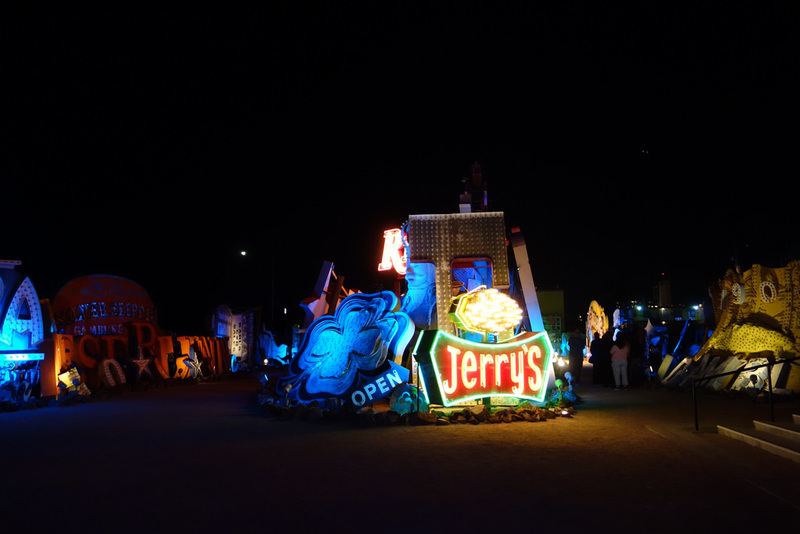 If you too like neon, The Neon Museum is a must see, and it’s one of the few museums that is not only open past 5PM, it’s much better to see when it’s dark. The basic visit is buying tickets for a specific time to get a tour of the “bone yard” where there are piles of defunct signs, with a handful here and there that are functioning, at least partially. The tour guide takes you through a 45 minute walk through the outdoor bone yard, sharing history of the signs and the city. It’s fascinating, and the walk outside on a cool desert night is quite enjoyable. But what was really breathtaking is the Brilliant! show. I had no idea what to expect from this ticket add-on, and somewhat expected it to be a tourist trap. 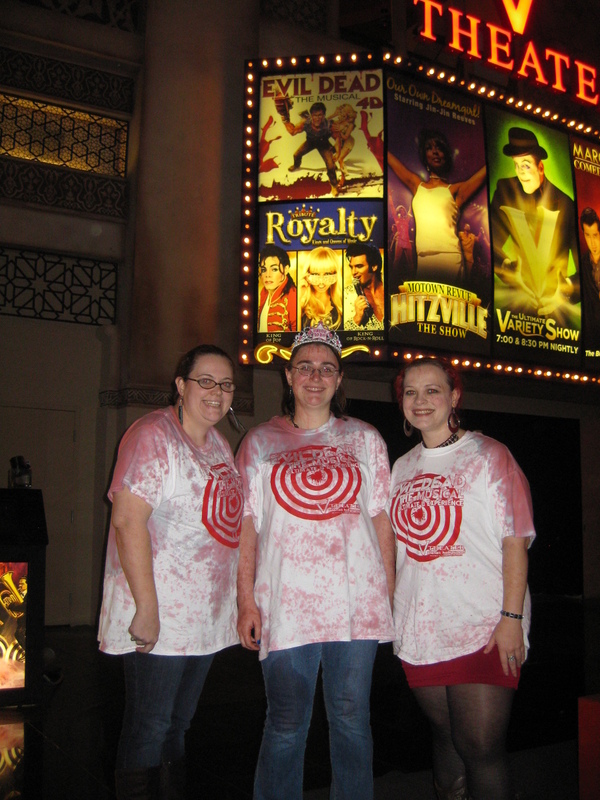 Instead, it was one of the most amazing things I’ve seen in Las Vegas. You walk from the museum over to a separate area where you’re surrounded by dead signs. Repeat after me: dead. They don’t work. They aren’t plugged in, most are missing their lightbulbs. The signs don’t work. In the middle stands a couple pillars whose purpose becomes clear quickly. The lights are shut off and you’re then dazzled by the signs coming to life, with help from the pillars that contain a series of projectors that precisely beam out overlays onto the signs that make them look like they’re functioning. No joke, I couldn’t believe my eyes. A soundtrack is played during the show featuring classics from Las Vegas standards Sinatra, Elvis and others, adding a bit of heart and nostalgia to the show. Dead signs come to life for Brilliant! Truth is, not everything is open all night in Las Vegas, but a lot is. You’ll find lots of places open until midnight, but even over night there are always places you can find to grab a bite. If you want to take a walk down the strip in the middle of the night with a beer or cocktail in hand, go for it! Everyone else is. My only word of caution goes for any time in Vegas: it’s a tourist town, there’s crime of opportunity (usually theft, pickpockets), don’t get too drunk and don’t venture off-strip. THE SHOWS! Vegas is a must stop for many of the most popular acts of the day, so you can sync up your trip to see your favorite singer, though I never have. I did see (and meet!) Penn & Teller here, went to The Evil Dead musical during my bachelorette party, have been to a variety of Cirque du Soleil shows. Every time of live performance you’d want to see, it’s probably here. Also, they now have a home hockey team with a stadium right behind New York-New York on the strip, and a football team is coming soon. 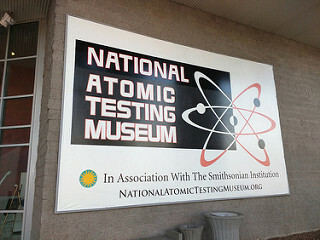 I already mentioned the Neon Museum, but also of note is the The National Atomic Testing Museum. Atomic testing was done within view of Las Vegas and people used to have viewing parties around the explosions. It’s the perfect site for this museum. The city also plays host to world class exhibitions that have found a more long term home here. 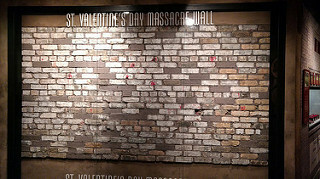 I worried that exhibits like the Titanic one at the Luxor would be sub-par, but it was tasteful and well done, and houses “The Big Piece” – a huge section of the hull that was recovered and made the visit worth it on its own. It’s probably a bad idea to glamorize the history of Las Vegas that’s littered with mobsters, but it’s hard to avoid it. I stayed at The Flamingo due to its origin story that included Bugsy Siegel (also, it’s pink, and iconic!). 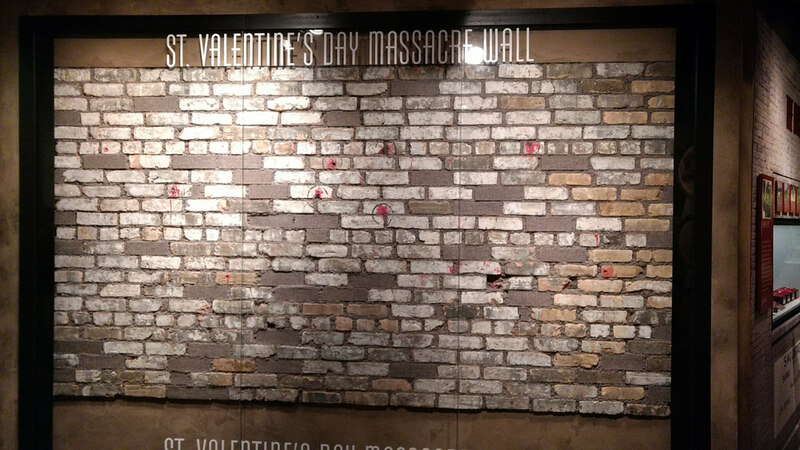 The Mob Museum near downtown Las Vegas is deliciously in a former courthouse and includes such amazing artifacts as the actual wall from the St. Valentine’s Day Massacre. Macabre, perhaps, but amazing. And then there’s downtown Las Vegas itself. 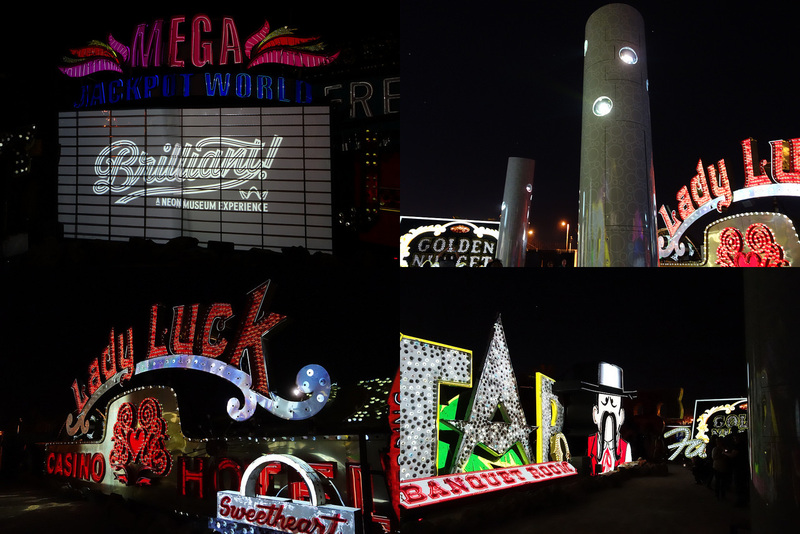 I didn’t go in the evening when the giant screens above you light things up, but I did pop into the Golden Nugget and check out other must see neon signs one afternoon. Even though I’ll still likely stay near the strip in the more expensive part of town, it’s worth the visit, and everything really is cheaper there. So. Much. Food. Take the normal American excess, and pile on the endless crab legs and chocolate fountains. The crowned best Vegas buffet changes over time and I’ve been to a few great ones. There’s also spectacular fine dining that you should get reservations for, some of the best restaurants in the country have a location in Las Vegas in addition to places like NYC and LA or SF. I love food, so this is definitely a draw for me. 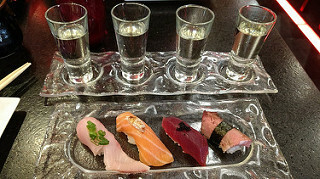 Sushi and sake flight, would order again! 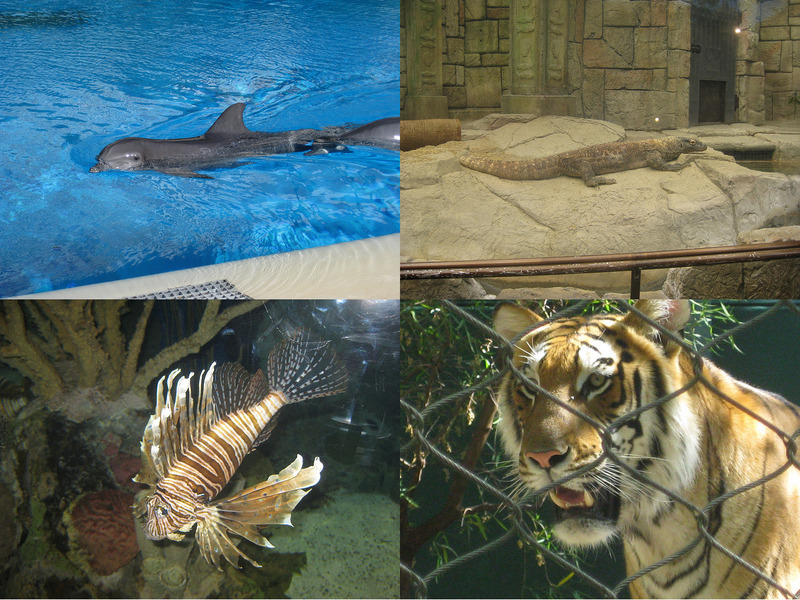 Siegfried & Roy’s Secret Garden and Dolphin Habitat over at The Mirage has dolphins! And lions! And Tigers! It’s one of my favorite places. There are also a handful of aquariums, one at The Mirage and another at the end of the strip at Mandalay Bay. Caesar’s Palace also has a big fish tank you can see for free that they like to call an aquarium, but I was a bit disappointed, though it did allow me to see the also free “Fall of Atlantis” show, which has super old animatronic characters and was actually kind of funny, plus there was fire. My pale complexion is not a huge fan of the sun, but I do love pools. 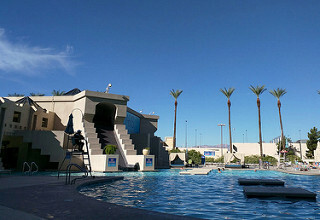 One of my strategies is going out in the morning, before the pool gets crowded and the sun too high overhead. You could also rent a cabana, which is not cheap… but it is cheaper in the off-season, and will provide you a dedicated space of your own, food and beverage service and other goodies. Boulder City is right nearby! Next time I’m there I want to go on the Nevada Southern Railway excursion train. And the Hoover Dam is just 40 minutes away! You can also visit the west rim of the Grand Canyon on a day trip, which isn’t quite as impressive as what you’d see from the South Rim, but is still spectacular. But my recommendation? Save up and spring for the helicopter plus boat tour. You’re in a huge bus for hours with piles of strangers, treat yourself to more than just a nice view. 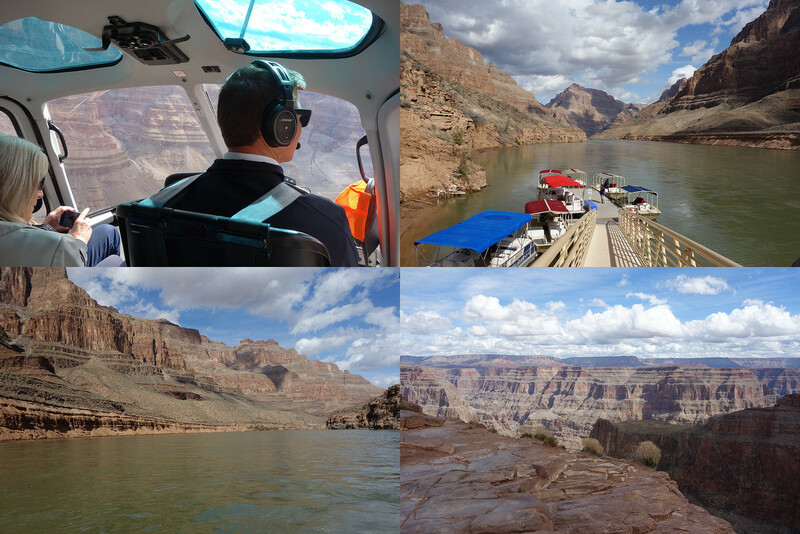 Plus, then you won’t be painfully jealous of the people on the tour who do take the detour over to the helicopters. It’s not long, but it’s an experience I won’t forget. Finally, I also do hold a fondness for all the replicas. The giant pyramid of The Luxor, the Eiffel Tower, miniature New York City, the recreation of ancient Rome. It’s all less popular these days with the staggering rise of high end resort-style hotels, but I love this old stuff. I reveled in the night spent at The Luxor, and a stroll through the columns and Roman Gods of Caesar’s Palace topped off with a great Italian meal is quite the treat. I also like walking down the strip, but on hot days it is nice to catch some of the trains, on my last trip I discovered the free tram that now connects The Bellagio, Aria and Monte Carlo, which gets you a nice chunk of the way to New York-New York, and the next train that connects the Excalibur to the Luxor and Mandalay Bay. Las Vegas also has a (paid) Monorail on the other side of the street, that I used a bit when staying at The Flamingo. So, much to do in Las Vegas without drinking or gambling! The excess is certainly not for everyone, but I enjoy it for a leave-the-real-world-behind escape. This entry was posted on Thursday, June 28th, 2018 at 6:16 pm and is filed under travel. You can follow any responses to this entry through the RSS 2.0 feed. Both comments and pings are currently closed.